F-Tech Engineering is leading submersible pump spares manufacturers in India. 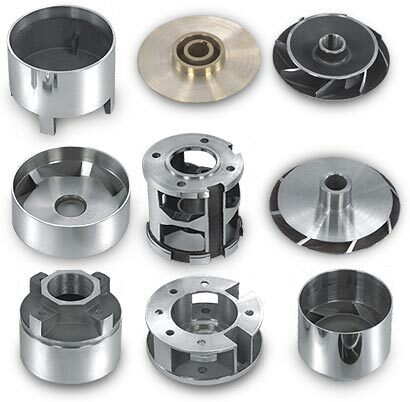 All pump parts are of Genuine Quality and made from M-45 grade imported sheet having high silicon. Due to superior quality of raw material used in submersible spares manufacturing, these spares are known for their strength and engineered to give the best operating efficiency. F-Tech Engineering manufactures genuine quality submersible pump spares for V3 Submersible Pump, V4 Submersible Pump, V5 Submersible Pump, V6 Submersible Pump, V6 Stainless Steel Submersible Pump, V8 Submersible Pump, Horizontal Openwell Pump, Vertical Openwell Pump, etc. Bowl (V3 & V4) F-Tech diffuser/bowl are made from GFN-3 Vergine (Noryl) With Stainless Steel Jacket. Bowl (V4, V5, V6 & V8) F-Tech diffuser/bowl are made from Stainless Steel 304 grade non magnetic investment casting material. Stamping Made from M-45 grade imported sheet having high silicon. Impeller Dynamically balanced and made from Stainless Steel 304/410 material (gunmetal) with Stainless Steel 304 grade neck ring. Upper & Lower Housing Made from Cast Iron / Stainless Steel 304 grade non magnetic investment casting material. Base Made from Cast Iron / Stainless Steel 304 grade non magnetic investment casting material. Connection Piece Made from Cast Iron / Stainless Steel 304 grade non magnetic investment casting material. Suction Made from Cast Iron / Stainless Steel 304 grade non magnetic investment casting material. Outlet Made from Cast Iron / Stainless Steel 304 grade non magnetic investment casting material.